Pioneers in the industry, we offer socket weld fittings from India. With an aim to fulfill varied requirements of our valued clients, we are engaged in offering Socket Weld Fittings. 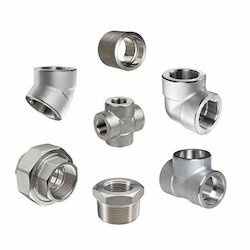 These fittings are used in a variety of industrial applications. Chemical processing plants, automobile, mechanical parts factories are the firms that insist for such fittings on a daily basis. With the purpose to offer a vigorous grip, the offered fittings are fabricated utilizing steel grade alloy. Also, the bandwidth of fittings is 2.5mm. Besides, the provided fittings are made available at industry leading rates.